Sometimes, a film doesn’t require a big budget or huge names in order to be effective. 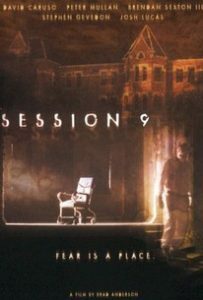 Such is the case with 2001’s Session 9. Directed by Brad Anderson – he of The Machinist – the story revolves around a small asbestos removal company that agrees to take on a job at an abandoned mental institution. Things start to go bump in the night… and in the day. Starring David Caruso (pre-CSI: Miami), Josh Lucas and Peter Mullan, here are five reasons to scare the crap out of yourself and watch it this weekend. This movie was filmed at the Danvers State Mental Hospital in Danvers, Massachusetts. The type of structure of this building is significant: it was based on the Kirkbride plan, which was idealistic at best but tough to maintain. It was massive and wanted things like well-vetted aides that made a living wage and large, open spaces with plenty of fresh air for the patients. The problem is that by the late 1800s, governmental funding was cut to buildings like this. The buildings fell into a state of disrepair and decay, and many stood vacant in that state for a good 75 years. Danvers closed in 1992, and it stood until 2005, when it was demolished. As if that’s not creepy enough, Danvers also stands in the town that used to be Salem Village. Yes, that Salem village. The association alone is chilling. Oh, and any H.P. Lovecraft fans? Fun news for you: Lovecraft was supposed to have based Arkham Sanatorium on Danvers. Danvers may have had a pie-in-the-sky type of conceptual beginning, but make no mistake, this place was rumored to be haunted for a reason. As the bulk of treatment at this hospital happened before that pesky little thing called “ethics” was introduced to modern psychology, patients could expect to be sexually abused, beaten, chained, restrained in straightjackets for long periods of time, and given a lobotomy. In fact, Danvers is widely rumored to be the place where the pre-frontal lobotomy was born. As it was an open environment, these poor folks – some of whom were truly very mentally ill, others who happened to piss the wrong person off and were sent there as punishment – were left wandering about in a poorly-staffed, sprawling environment. There are rumors and anecdotal evidence of hauntings, including strange movements and disembodied wails. After everything that went on there, I can’t say I’d be surprised if the building was haunted. Torture like that has to leave a mark somewhere in time and space. How can we make this creepier? I KNOW! Small business owners and freelancers can totally latch onto this one. Remember how I said earlier that the story revolves around a small asbestos removal company that agrees to take on a job at an abandoned mental institution? Yeah, there’s more to it than that: these guys agree to a damn near impossible job. On average, it would take a good three weeks to remove the asbestos from that building; these guys agree to do it in a week. It’s not like they’re rearranging furniture here, people – they’re removing a hazardous, cancer-causing material from the walls of a massive building that hasn’t been kept up properly. Owner Gordon (Mullan) takes the job to keep the business afloat. It’s a testament to the nightmare you’re willing to take on in order to make ends meet. Oh this one is so relatable. Not only do these folks have problems, but these folks have problems that just won’t stop piling up. Mike (co-writer Stephen Gevedon) is a law school dropout who finds a bunch of therapy session tapes; Hank (Lucas) and Phil (Caruso) have both lost their girlfriends and are looking to distract themselves; Jeff (Brendon Sexton III) is deathly afraid of the dark; and Gordon is attempting to keep his business alive while adjusting to a new baby at home that loves to cry, which adds a ton of stress to his marriage. When it rains, it pours. This film is a stark reminder that stress can definitely come at you at a running tackle, and it’s not willing to let up for even a second. 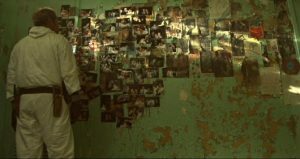 Mike is the one who finds the tapes of mental patient Mary, who suffered from multiple personality disorder. Mike keeps listening to her sessions – one through nine – in a morbid curiosity designed to keep himself entertained during his grueling job. Mary provides the narration as we watch our men work, her different personalities and voices coming out to tell us where they live and what they’ve done. Her doctor is trying to get to the murderous personality, Simon, and, well, we all know where this is going. This movie – between that plot, its execution and its setting – will make your skin crawl. There’s a reason it’s a cult film. The best luck you’re going to have in finding this one is Amazon. It’s well worth it.